All Aboard! 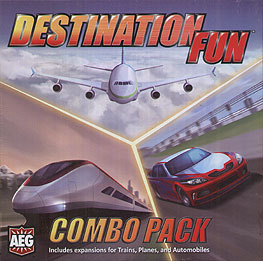 The destination... FUN! Trains returns with all-new cards and strategies for you to build the best rail system in Japan. This expansion not only features all new cards, it includes three entirely new boards. Two of the boards are designed specifically for 2-player games, while the Okayama map is a new challenge for 2 to 4 players. Route Bonus Cards are also included, allowing you to score additional points for being the first to connect specific stations. This expansion features two new boards, providing more airports to explore. An entire deck of new playing cards allows players to experience the game with new actions and goals. New planes tokens give players more options to customize airport boards with endless variety.